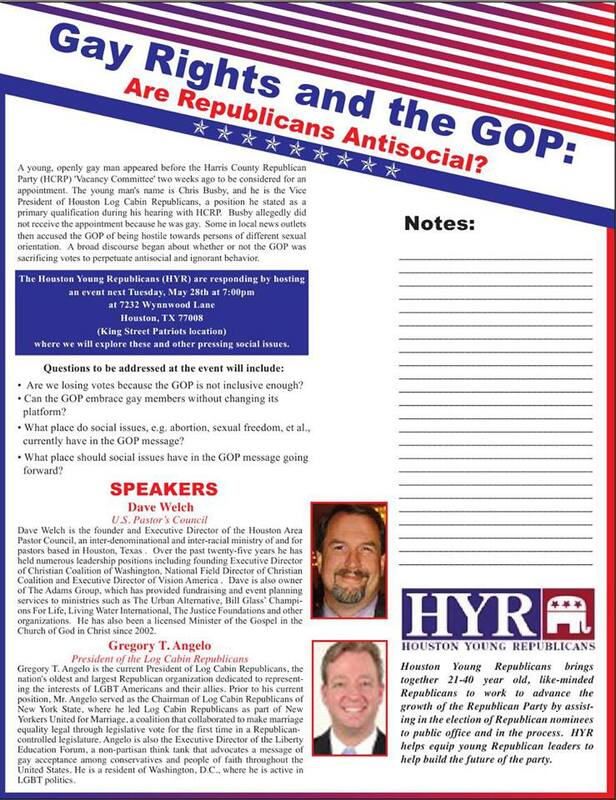 Gay Rights and the GOP: Are Republicans Antisocial? A young, openly gay man appeared before the Harris County Republican Party (HCRP) 'Vacancy Committee' two weeks ago to be considered for an appointment. The young man's name is Chris Busby, and he is the Vice President of Houston Log Cabin Republicans, a position he stated as a primary qualification during his hearing with HCRP. Busby allegedly did not receive the appointment because he was gay. Some in local news outlets then accused the GOP of being hostile towards persons of different sexual orientation. A broad discourse began about whether or not the GOP was sacrificing votes to perpetuate antisocial and ignorant behavior. The Houston Young Republicans (HYR) are responding. HYR has decided to host an event next Tuesday, May 28th at 7 p.m. at 7232 Wynnwood Ln, Houston, TX 77008 (King Street Patriots location) where we will explore these and other pressing social issues. Speakers will be Dave Welch, U.S. Pastor's Council and Gregory T. Angelo, President of the Log Cabin Republicans. Are we losing votes because the GOP is not inclusive enough? Can the GOP embrace gay members without changing its platform? What place do social issues, e.g. abortion, sexual freedom, et al., currently have in the GOP message? What place should social issues have in the GOP message going forward?